One of the last times Mumford and Sons was playing in the state of Tennessee, Marcus Mumford left the stage to throw up in the middle of the set. This time, playing to an overjoyed crowd on a surprisingly cool August night in either Virginia or Tennessee—I’m still not sure– Marcus & Co didn’t vomit during any songs. The same probably can’t be said of all of the boisterous fans who showed up in Bristol on Saturday to partake in the second stopover date on Mumford and Sons’ Gentlemen of the Road tour. 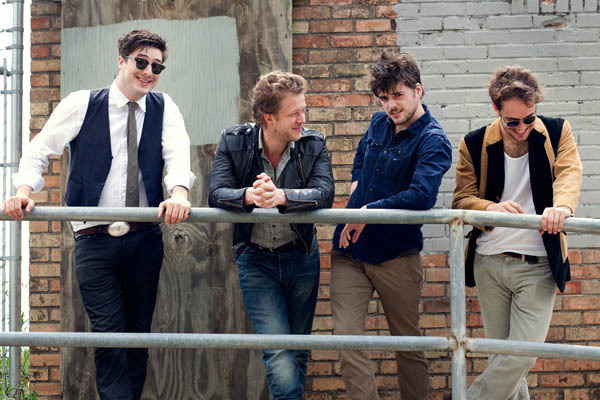 The Gentelemen of the Road stopover tour is genius by nature: Stop in a middle-of-nowhere town for a mini-festival including Mumford and a handpicked line up of some of their friends and favorite bands. Drink a lot of overpriced local beers, watch people complete needlepoint in between band sets, lose all cell phone service, stand in two states at the same time, and get your GOTR passport stamped so you can put pictures of it on Instagram. The result? A lot of fun for the bands and the fans, a lot of money for the bands, and the biggest economic gain most of these towns have seen since the Industrial Revolution. My day started off with a local IPA and a pepperoni and artichoke pizza, and slowly bled into a dry summer day with supersized Bud Lights and the sweet sounds of Simone Felice. They brought a surprising amount of energy to a smaller crowd on the smaller of the two stages, The Cumberland stage, and their rendition of Dylan’s “I Shall Be Released” won me over seconds into the song. Nashville’s own Mike Harris (The Apache Relay) joined them—and as far as I could tell, every other band—on stage at the very least to introduce his dear friends. As the crowds tried to navigate the strange alcohol restrictions and the long ATM lines, Haim took the stage and provided the festival with their daily dose of LA and Estrogen. The only girls holding down the stage at the festival, they refreshed the red-bull chugging crowds on the side stage. When The Apache Relay switched time slots, the crowd bustled back and forth between stages, piling up by the main stage to see these southern sweethearts. After watching them play everything from house parties to Ryman opening slots, seeing thousands of people push closer to the stage during their short thirty minute set made some Nashvillians feel a little bit like proud parents. Michael Ford’s stage presence is still powerful and mesmerizing, and the rest of the band has come together as bonafide rock n rollers. Playing a mixture of new tunes and tracks from their latest, American Nomad, they were—as always—nothing short of drool worthy (and the Billy Reid drags didn’t hurt!). As the crowd started to lay down Gentelmen of the Road blankets and stumble across the way to see Jeff The Brotherhood, Mike Harris showed up in between the stages with a megaphone and a crowd of followers. Marching through the masses saying God-knows-what, they corralled behind him as he headed down the road. Somewhere during the day, Justin Townes Earle dropped the E off of his last name, confusing me and probably nobody else—at least, according to the ticket passport. Looking good and sounding better, JTE kept the main stage audibly entertained, plowing through his deep repertoire for the late afternoon crowd. As the sun started to set and the fans started to settle, a lot of us realized we forgot to eat dinner and didn’t have cash. People flocked to the merch booth for GOTR tees and bro-tanks, each stopover having its unique merchandise. The beauty of the Bristol stopover? Best logo.